“Stahl House (CSH#22)” photographed by Julius Shulman (1960). From VISUAL ACOUSTICS, an Arthouse Films release 2009. Julius Shulman, the late master architecture photographer, helped to shape the career of some of the most important architects from the modernism movement. Most importantly, with his photographs he introduced an innovative lifestyle to society. He saw it as selling architecture. 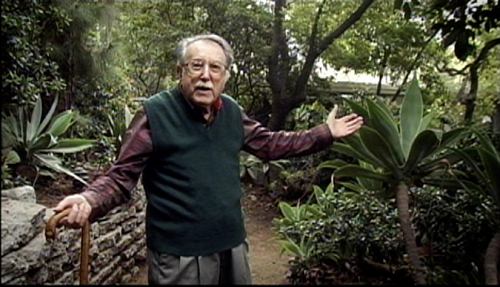 Iker Gil interviews Eric Bricker, director and producer of Visual Acoustics, a film that celebrates the life and career of Julius Shulman. ERIC BRICKER – INTERVIEW from Spirit of Space on Vimeo. IG: How did you get in contact with Julius Shulman? EB: I was living in Los Angeles and I had met Julius’ next-door neighbor. I wanted to rent an apartment building that she owned but she didn’t have any vacancies. So I called her up and I said, “Next time you are on the street (I was living on the same street), come on over for coffee or tea or something, and let’s talk” in the hopes of getting moved up to the top of her list. When she came over, we got to talking, and I needed some 1930s photographs of San Francisco, black and white (I was working as an art consultant at the time). I don’t know how this came up but she said, “Well, you should call my next-door neighbor. His name is Julius Shulman. Here is his telephone number”. So I called him up and he answered the phone, “Julius Shulman” as he always used to. I explained to him who I was and what I was looking for and he invited me over. I went up there, I didn’t know who Julius was at this time. So on that day, and I will never forget that day, he was on the phone when I arrived at the studio and he motioned for me to come in and pointed to make myself at home. I sat down and I picked up one of the Taschen books, Architecture and its Photography. I started looking through this book, and I was just stunned by these photographs. And I was equally stunned by him as a person. We had a really great exchange on that day, he reminded me of my maternal grandfather. I just wanted to become friends with him, I thought I wanted to get to know this guy. Over the next two years I just kept going back, and we developed this friendship. That was in 1999 and in 2001, I proposed the idea about doing a documentary on him, the photography, etc. When I asked him, “What do you think about me doing a documentary?” his response was, “Well, I don’t see why not”. From 2001 until the end of 2003, I researched the material to try to get an idea on the story/ies and how to formulate a point of departure for the film. We started shooting the film in 2004, I pretty much finished shooting by mid 2006 and I finished the film in May of 2008. IG: How was it working with Julius Shulman? Was he hands on or hand off the film? EB: A little bit of both. When we were creating the film, Julius was a combination of hands on and hands off. In terms of hands on, he loved to be in front of the camera. When we were interviewing, he was just thriving on this. And also, he could never let go of what was going on behind the camera. So every interview, he wanted to compose everything as he is sitting in front of the camera. At times, it was even kind of difficult because he wouldn’t answer a question straight. He would say, “ Now I am going to sit down here, and I am going to look in the camera, and I am going to start talking about the early years of Neutra”. He would say this, and then, when we would actually get everything set up to do it, he wouldn’t want to do that again. In terms of hands off, Julius and his daughter, Judy, never once questioned what I was doing. I had free range of the archive. I could take 4 x 5 color transparencies, which, you know, there is only one, negatives, photographs… I had access to everything, I had the keys to the studio, I could sleep there… and they never once said, “Hey Eric, what have you been up to all these years?” They trusted me and it was amazing. IG: How did you choose the people involved in the film? EB: The way that we chose the different people to get involved in the film was pretty much approaching people, both production wise or also on camera, that had an association with Julius, who personally knew him or knew enough about him to have an informed and experiential place from which to speak. Also, I had to find particular experts on subjects as well. So it was a combination of those things. I wanted to pull those two ideas together in terms of qualifying participants. Now, there are some people that were left out, a small number, but people that really should have been in the film. But we had so many interviews already that we had to stop, from a production stand point and editing as well. IG: What is Tom Ford’s relationship with Julius? EB: The reason that Tom Ford is in the film is that he restored a Neutra home and I think he had Julius photograph the home for him. I am pretty sure that is accurate. I think Leo Marmol and Rod Radziner did the restoration for Tom Ford and Julius photographed the home. Tom had met Julius and loved Julius and he is kind of emblematic of the majority of people involved in the film. When I asked his office, “Could he possibly participate?” it was a resounding, “Yes!”. 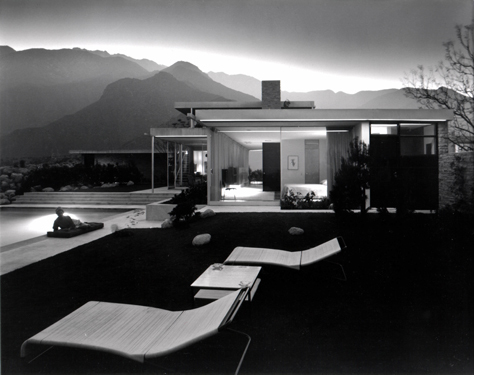 IG: The photographs of Julius Shulman helped to shape the career of some of the most important architects from the modernism movement as well as discover new talent. What do you think it was about his work that set him apart? EB: I think what set Julius Shulman’s photography apart from, perhaps, some of the other photographers that were working at the time, was that he was able to infuse, I think, a sense of spirit. It comes from him, really, I think it’s in a way his spirit that is infused into the photography. I think he was the perfect ambassador for this, because Julius was the eternal optimist. He is the person that says, “We can do this, we can pull together, we can create, we can shape, we can make something better, we can help evolve”. And that’s what I believe these architects and designers really were so passionate about. And they were looking at technology, and new materials, and seeing how ultimately they could rework things to make life better. And I think Julius saw that in the work. I think he was a person who wanted the same things and he had enough artistry to articulate that in an image. 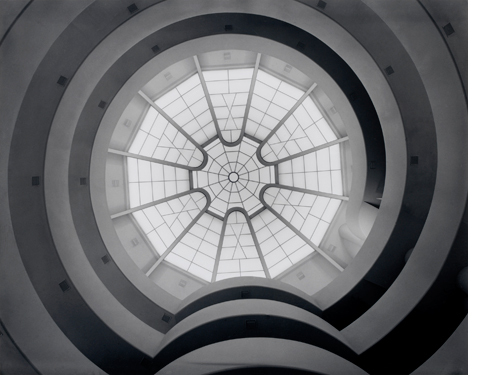 “Solomon R. Guggenheim Museum” photographed by Julius Shulman (1964). From VISUAL ACOUSTICS, an Arthouse Films release 2009. 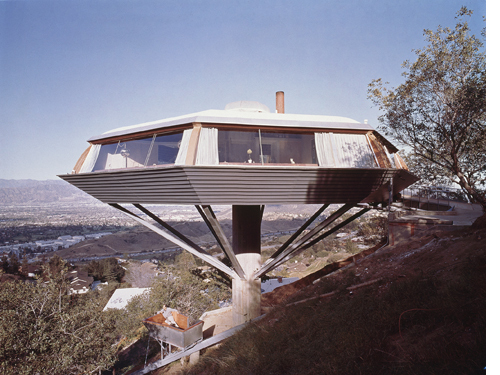 “Chemosphere House” photographed by Julius Shulman (1960). From VISUAL ACOUSTICS, an Arthouse Films release 2009. IG: He also helped to introduce an innovative lifestyle to society. As Steven Kurutz said in a recent article in the New York Times, he “wasn’t simply an architectural photographer but a lifestyle propagandist”. Did he realize that he was having this effect and what were his feelings about it? EB: Julius was a master at many things. He was a master photographer, he was a philosopher of everyday life, he really was somebody who mastered and actually had an art of living, and he was also a master sales person. He would tell you that his job was to sell architecture. He would always talk about when somebody opens up a magazine and sees an image, it is your job, if you are providing that image, to make a statement. He always talked about this, making a statement. He was a master storyteller. You open the magazine, and you are turning and flipping the pages, there is an ad for something and you stop because the picture just captures you. The picture has enough going on, a story that makes you stay on that photo. And youstart to go into the photo, and start to absorb some of the other statements that are in that. Julius knew exactly what he was doing and why he was doing it. Joseph Rosa’s book [about Julius Schulman] is called A Constructed View, and that is exactly what he was doing, he was constructing these views to tell a story. Going back to selling architecture, selling wasn’t a negative thing for Julius. Quite often we see it as manipulative. For Julius, it was exciting people, inspiring them. He wanted the people to live the best quality of life they could. He would get frustrated at them when they were not doing that, as did Richard Neutra and so on. Ultimately, it was inspiring people to want to go and live this life as well and that’s what he saw as selling architecture. IG: He portrayed mid-century Los Angeles like nobody else. Was he interested in portraying the life in contemporary Los Angeles? EB: Very much. When he “came out of retirement” late 90s and started photographing again he was excited about the new forms and I think it took him a while to, in some ways, open up to them. But I think there was enough of an openness that he was excited to see where architecture was going. I know he reacted at times when he would look at this idea of “starchitects” and all the money that was put towards those projects. You know, everybody wants a “Bilbao” now, and I think he saw the hype behind it and he reacted against that, but ultimately, the underlying feeling was, “This is it. It’s like we have cracked it, we have broken it open”. Maybe looking at it in terms of the United States because in other places, like in Europe, the common person is so much better informed and appreciative of architecture. But Julius saw it in terms of the States. He kept saying, “It’s never ending, it keeps growing”. With Los Angeles, he was excited about what was going on there. He had been documenting Los Angeles since he was 15, 16… and he loved Los Angeles. I would say Julius Shulman is Los Angeles. Even just from that perspective too, he was really excited to see the change in the city, a city that has become a world-class city at this point. “Kaufmann House” photographed by Julius Shulman (1947). From VISUAL ACOUSTICS, an Arthouse Films release 2009. 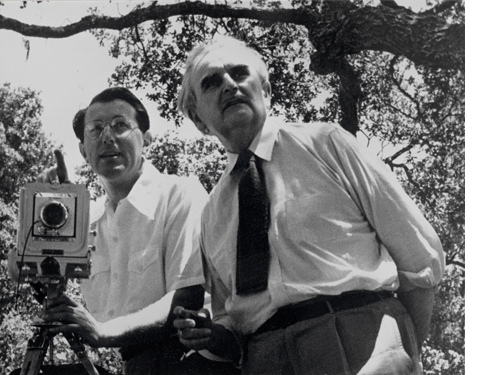 “Julius Shulman and Richard Neutra” (1950). From VISUAL ACOUSTICS, an Arthouse Films release 2009. IG: In your film, you mention that he retired when Postmodernism became the dominant trend. What was it that he found encouraging about recent architecture that inspired him to pick up his camera again? EB: In my opinion, it was a combination of things what pulled Julius back from retirement to photographing, and not just to photograph a few projects here and there. In the last 10 years, from 1999 to 2009, he did a lot of work. I think he was excited with the direction of architecture and also the exposure of architecture just in general. And also, Julius lived for this. People have been asking, “Why didn’t you go into his personal life in the film?” There are reasons why we didn’t, but what I’ve come up in watching the film, talking to audiences, and going deeper into this is that this is Julius’ personal life. Architectural photography, photography in general, buildings… That was his personal life. He was retired and spending time with his second wife, Olga, down in a condo in Florida at times, and I think he enjoyed that, but as soon as Olga passed away, you see that he dives right back into his work. And that is what I think sustained him in terms of living. That was his reason to live, his work. IG: Do you know which photograph he was most proud of? 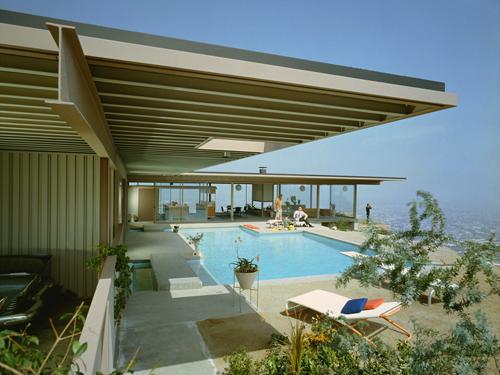 EB: In terms of his work and the architects that he worked with, he never commented on what his favorite photograph or architect was, but you can see because of the fame, that the famous shot with the two girls at the Case Study House #22, was the one that he would most often reference because people knew that image. In describing that image or the experience, he could really help spread some of the other messages that he had. In terms of his favorite building, there is a great show on KCRW (the NPR station in Santa Monica), called DnA hosted by Frances Anderton. Every week she asks different people about their favorite buildings in LA, and when she picked Julius, he said his favorite building in LA was the Bradbury building. When he was photographing the interior for the second time, I think it was late 80s early 90s, he had commented how he was so inspired by what he was seeing. He had talked about the idea that this building, this interior, had “visual acoustics”. He could hear what he was seeing, and that was actually the working title for the film. He said that again when he was photographing Disney Concert Hall, which we have that footage in the film. Thus, the title of the film. IG: How has the film been received so far from the photography community as well as the architecture community? EB: In terms of how the film has been received in the photography community, I haven’t seen enough interviews yet, or critiques, or just overall observations from that community. I am hoping to get more. From the cinematography community, I have met a number of people and they have been really inspired by the work. In the architectural community there seems to have been a great reception, people are really excited. They feel that the way the story is being told and the character of Julius seems to be so magnetic. It was set up that way. Julius is the portal, the audience has to fall in love with this character and then they can get pulled into this larger story of architecture. People have received that quite well and have been very complimentary. I was reading today what Christopher Hawthorne, the architecture critic for Los Angeles Times, had written and he was commenting on some things that were left out of the film. I want to talk to him because from an architectural stand point, I see his point and it’s accurate and yet, I feel like if I would have addressed the things that he was talking about in that interview, then I think this film probably wouldn’t have had a chance for a wider theatrical release where people can get turned on to the material. And also, ultimately his ideas are better done in a book. IG: Where would you like to have your film shown? EB: The film was designed for two audiences. The architectural / photography / art museum / Los Angeles audience who know about Shulman and his work on one side, and everybody else on the other side. The idea is to give each of those groups something that hooks them into the film and gets them inspired, and even wanting to go out and know more about whatever it is, the architecture, etc. We have been really fortunate. The film has already been released, opening in New York two weeks ago. We just opened in Los Angeles last week at the Nuart Theatre. People came out for this film and it did really, really well. Now it’s moving to the Landmark Pavilion, so we got extended in a top notch theater, and that was the goal. Basically what is happening is that we have a US theatrical release, opening in 20+ cities from now until the end of January: San Francisco, Seattle, Boston, it will come back to Chicago… It’s an opportunity to reach a wider audience. After that, we will focus on the academic world: universities, high schools, etc, and we will have screening through those organizations. The DVD will be released in April and then it will premiere on the Sundance channel May 1st, I believe. And then, it is exciting because we have the different pieces of the international distribution lined up but I think once we have the bulk of the US, then we will start seeing in which countries there will be a theatrical release. There is a strong chance to getting theatrical release in the UK, France, Germany… those are three right now that we are looking at. IG: Is there any question about the film that has not been asked that you would like to be asked? EB: That’s a question that I have never had so it is a good question! In terms of questions that have been asked, I love speaking with the audiences because the questions that they are asking are really inspired, insightful questions. At every screening I go to, there is usually one question that I haven’t thought of yet. That is a good sign. I can’t think of a question that hasn’t been asked yet which I wish people would ask because they really seem to be in tune with the material and again, through their observations, I am learning more about the film. Julius Shulman. From VISUAL ACOUSTICS, an Arthouse Films release 2009. 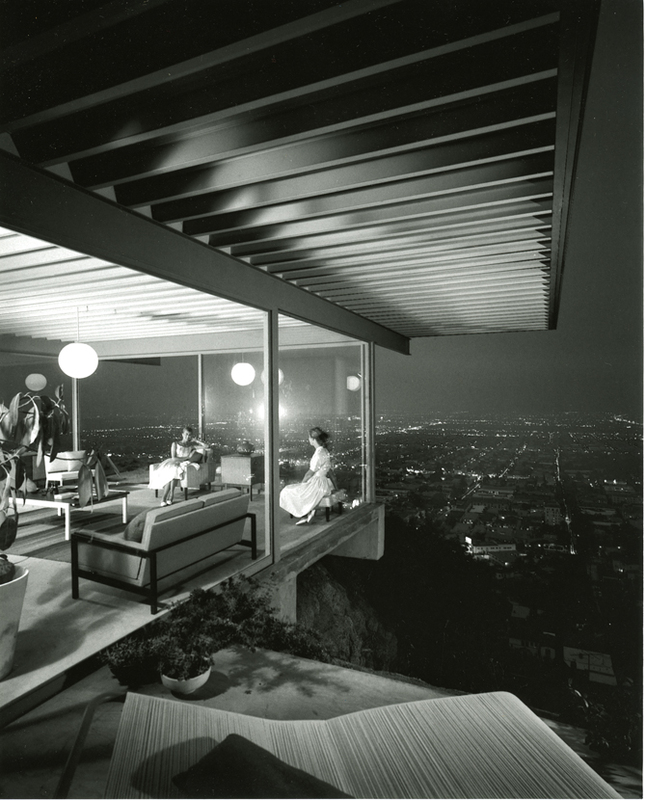 Eric Bricker is the director, writer and producer of Visual Acoustics: The Modernism of Julius Shulman. He graduated from Indiana University receiving his B.A. in English Literature with a minor in Theatre. Originally from St. Louis, he lived in Los Angeles for 15 years before recently moving to Austin. He is currently at work on a narrative feature film exploring the contemporary art world while running Kaleidoscope Mediaworks. Iker Gil is an architect, urban designer, and director of MAS Studio. 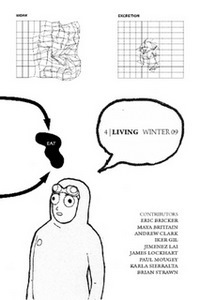 In addition, he is an Adjunct Assistant Professor at the School of Architecture at UIC. He is the recipient of the 2010 Emerging Visions Award from the Chicago Architectural Club. Spirit of Space is an organization that uses digital media to promote greater awareness of designed environments formed by Adam Goss, Red Mike, Ryan Clark, and Dean Storm.